Virtual reality is the next big thing in gaming, and the Oculus Rift is a VR headset which promises to bring immersion to the next level. Overall, the Rift looks like a cool experience—but as this this video by Brendan Caldwell shows, people can look quite silly while using it. 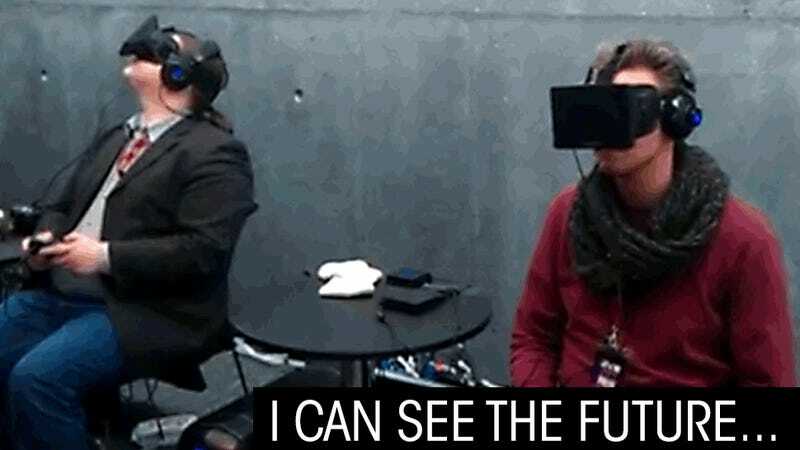 So What&apos;s The Oculus Rift Really Like? The video comes from EVE Fantast 2013 —that's the "massive celebration of the virtual world of EVE Online." People from all over the world come to Iceland to celebrate EVE, basically. CCP, the developers behind EVE, made an experimental dogfighting game for the Oculus Rift, and that's what is presumably being played in the video. Now take a virtual reality headset, and add a virtual reality treadmill. ...yup, the future of gaming looks rather absurd, don't you think? Not that motion-control gaming looks any better, I'm sure.